I love a good thunderstorm. And I especially like thunderstorms in South Florida. This is where I grew up. For me, there is something familiar and endlessly fascinating about the towering black and white cumulonimbus of the subtropics and tropics. I’ve experienced storms in other places. They can certainly be powerful and dramatic. But none of them excites me to the depth of a Florida thunder and lightning burst. One afternoon, as I was driving across the Tamiami Trail between Naples and Miami, I noticed a large bank of clouds brewing dark and ominous over the Gulf of Mexico to the south. It was heading my way. 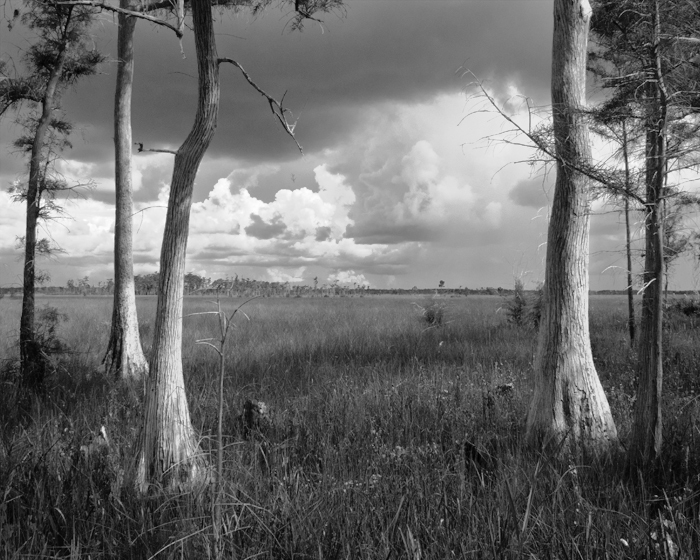 I started looking for a landscape scene that would feature the coming storm; the combination can be striking—as evidenced by Clyde Butcher’s black-and-white images of the Florida Everglades. Not long after spotting the storm, I found what I was seeking. Standing a short distance off the main road was a small group of dwarf cypress. Their forms were interesting. I liked the way that they framed the extensive sawgrass prairie beyond. And the lighting was dramatic due to the ways that rapidly shifting clouds were intercepting sunlight. Knowing that time was of the essence, I pulled off onto the grassy shoulder of the road and quickly gathered my camera gear. I took off my shoes and waded into the grassy waters. As a South Florida native, it feels very natural for me to be barefoot. I like to feel what I’m walking on. I enjoy the sensations of hot and cold, of smooth and rough, and more that my skin detects. It’s all part of the experience of being alive. As I waded out to the trees, I watched bolts of lighting flashing from the cloud mass. I set up my camera in the water. Not the safest arrangement, perhaps. But everything worked out fine. The resulting image has shadow and highlight texture that I like very much. There is a quality in this photograph that some have described as painterly. And that, since my father was an oil painter of seascapes, and I was close to my father, especially in the later years of his life, feels good to me. All images and text are copyright © Joel Geffen 2012. All rights reserved worldwide.